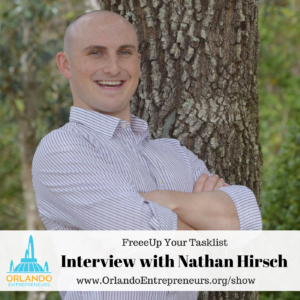 Nathan Hirsch, founder and CEO of FreeeUp.com, lives the life he dreamed of as a high school student. He broke away from the tradition of finding a “real job” and became an entrepreneur who sold over $25 million on the Amazon Marketplace while at college. Would you like to know how he sold $25 million on Amazon and why he started FreeeUp? For over 15 years now, I have been on the entrepreneurial fast lane building successful multi-million dollar businesses accompanied by an unrelenting commitment to client service excellence and human resource leadership. In 2006, I founded my first online venture out of my college dorm room, selling and buying student textbooks. This idea was born to tackle the challenge of price disparity of textbooks in brick and mortar stores, thereby making it more affordable for students to procure them online. I then rapidly scaled my e-commerce business, bootstrapping from a $20 student – cause initiative to a multi-million dollar e-tailer clocking in revenues in excess of $30 million on Amazon across a 6 year period while serving over 10,000 customers. Our e-commerce business has employed over 50 workers in the US and has worked with over 150 globally while managing successful partnerships with over 500 distributors and manufacturers across the United States. And Amazon was getting old – pushing products – my entrepreneurial spirit was searching for something new. FreeeUp is a marketplace where businesses and companies can hire remote freelancers worldwide. Last year we paid out over $3 million to freelancers. Why am I so passionate about FreeeUp? It’s the human aspect of getting to help people, to help freelancers grow their business. I have stories of how freelancers have bought houses and cars, of how they are able to support their families. This means so much to me and Connor. We both wake up every day ready to tackle the next challenge and continue building the business. We want to keep spreading the impact that we’re already making to thousands more people.